To develop a harmonious partnership with its horse, the rider must make sure that all the work is confirmed and re-comfirmed at every stage of the training, from green to FEI. By constantly strengthening the foundation, and making sure the horse understands the rider’s aids easily, without confusion, fear or tension, the rider helps the horse build its confidence, its trust in himself and his rider. We need to know that our Grand Prix horse will be able to read us and answer us easily and subtly during his career. We want to prepare him physically and mentally to respond to our requests calmly, with power and balance and without hesitation – this is what we are working towards with the young horse. Having been gently started under saddle using in-hand work to introduce the ridden work to come the horse should now be in daily work for 45 minutes – walk, trot and canter. It is best to start with walk, but sometimes a young horse may be unsettled and not listening, and we may need to start with a canter to help him release tension, release his breath and begin to focus on the rider. We have to read our horse and work him as he needs. The rider at this stage must be very careful how he asks for everything; it would be too easy to push for too much, too soon. A young horse needs to move with energy, with an elastic body and a long neck. Why? Because this allows the young horse to have confidence WHILE LEARNING HOW TO USE HIS BODY, developing self carriage (independent balance) from the beginning of its training, and building the right muscles in the right places from the start.To become an athlete, a human might go to the gym five days a week to develop its body slowly with the right exercises. It is the same slow and steady process for a young horse who also has the added challenge of finding a new balance with a rider on his back. It is imperative that the rider/trainer recognises the fact that all horses are individuals and must be trained as such. Every horse has a different trot, needs a different contact, has a different posture in the body. Some horses have naturally long necks when they work, some will go high in the neck. Some have a naturally good rhythm; some horses need us to assist them in creating the rhythm very carefully. Whatever the situation, we must never force the horse to develop what we think is a “good” rhythm because this may make him rush, causing him to hollow his back and trail out more behind with his hind legs. Then he may never find his own balance and rhythm. By using force to create an artificial “frame”, we can destroy our horses’ confidence and balance. Over time, if we introduce tension by asking what they are not ready to give, they will become more crooked, stiff and heavy in our hand using a combination of evasive tactics. Instead of a willing partner moving fluidly forward in balance, the horse may become either passive and resistant, either too forward or constantly behind the leg. In both cases requiring the rider to work harder for less results and little pleasure for either horse or rider. There is a very fine line between a good rhythm, a rushing horse and a lazy horse. The rider must help the horse discover what his good rhythm is by giving him the right signals, so that the horse gets a clear message. With a young horse that has naturally good rhythm, the rider must not be tempted into asking for more power too quickly, or the horse may start rushing, with his hind legs trailing out behind. This is how we lose the horse’s natural balance. With a horse that is naturally forward, and maybe even rushing to start with, we create a slower rhythm. Many horses trot slowly with a small step. This may not look exciting, but it is their natural rhythm. The rider must be very patient, and understand that this horse is not worse than other horses. If allowed time, he will get it. He will get strong, he will give us everything he can and, if the training is sympathetic and makes allowances, he will become beautiful in his own right. He will build the right muscles and eventually find his own rhythm. Just try to help him maintain his natural rhythm and balance; do not push harder because he may want to run and rush. Sometimes the horse will hop into the trot from the walk, and some riders will think it is disobedience or anticipation. It is the horse showing you he is weak in the hind leg and unable to push off into the trot, throwing itself chest first instead. Sometimes a young horse will begin crow hopping in the canter departs, root or throw its head up, in each case the rider must consider carefully if they are throwing the horse off balance by riding it crooked or asking for exercises or a posture the horse’s body is not ready for. All aids must be in harmony with the horse’s “engine” so as to keep it purring smoothly forward – and every horse has a different engine. It is like changing the gears on a car: while the hand seeks the correct gear, the feet must work the clutch and accelerator independently so that there is exactly the right number of revs, and then there is no hopping or jerking. Horses will do their best for us because they are kind. We have to make sure we do not ask too much at the expense of their bodies and mind. Sometimes, so as not to destroy balance and rhythm, we have to do things the book doesn’t tell us; to worry less about getting it to look perfect. Putting the emphasis on looking perfect can cause bad communication and make a young horse confused. We are training – not looking for points in a competition. The aim of training a horse is not competition. Training is an end in itself. Making a horse as supple, flexible and beautiful as it can be as an individual is the ultimate goal. We want the horse to develop his own balance and rhythm to the best of his athletic ability, and so we are very careful with the horse’s posture. We are doing our horses and ourselves a big favor if we study the anatomy and biomechanics of how a horse moves. Take the time to watch what the horse is doing with his hocks because that is what he is doing with his nose. If his nose is behind the vertical, his hocks cannot come through to cover enough ground to create natural suspension. He may get his hocks high, but in a way that is bad for his body because he will loose the angle of the shoulder.The more experienced horse has to lift his knee a certain way to do piaffe. The knee to the shoulder becomes a different angle, and this angle must correspond with the angle in the hindquarter. Every part of the horse must work together to perform the advanced movements. If one piece is not working correctly, the whole horse cannot do the movement properly and the back cannot lift properly. Because the back dictates what the legs do, if any segment of the spine is blocked, the horse will be “missing” something in his movement, his hocks may trail, he may step short, his diagonal pairs may be uneven, etc.. The horse can move his legs and body, but if he is moving them without his spine being “connected” from poll to tail, than the result is stiffness, resulting in other parts of the body becoming blocked. The horse becomes hollow, he develops the wrong muscles, the muscles pulls the skeleton out of alignment and soon enough the rider instead of enjoying developing his young horse finds himself battling him, not understanding why a previously good horse is now resistant, blaming character for physical weaknesses and soreness and looking for solutions outside the riding such as as supplements, more severe bitting, etc.. The hollow horse can’t perform without hardship, and therefore cannot develop its own balance and rhythm to its fullest potential. A hollow horse cannot lift its belly and back. The vertebrae are jammed shut. When the horse’s back is up, the vertebrae are open. When the back is lifted, the hips and tail get lower. This is the posture to strive for. For the young horse starting its training we want longitudinal balance with the horse’s neck telescoped forward, the poll supple, the nose in front of the vertical, with a soft arch from poll to tail, and the eye between hip and stifle depending on conformation. One of the main reason for horses breaking down when they should be in the prime of life is being incorrectly trained in the beginning – ie., training that prevents a horse from developing in gentle stages his own balance and rhythm, and/or forces him into advanced movements before he is physically capable. 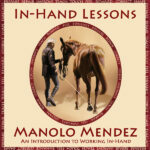 Working a young horse incorrectly – ie., working him behind the vertical, working him inverted- or allowing or causing him to use one side of his body more than the other – ie. too much use of one rein, unevenness – causes the horse to develop crookedness and stiffness and results in impure gaits and a horse that cannot work to his fullest ability, move forward in balance, in self carriage. There are many other factors that can prevent the horse from working freely, even when the training is correct. These are all too often overlooked by riders and trainers. In fact, it is quite rare to see a ridden horse in any discipline or at any level of training in any part of the world that is not sore in one or more parts of his body. As trainers and riders we have a duty to become knowledgeable about the biomechanical movement of the horse. – Foot problems associated with shoes and/or incorrect trimming are one of the greatest and most common causes of discomfort and pain. This is one of the main reasons horses start to break down in their work in their teens, and why so many horses have ringbone or similar lameness problems. – A too narrow or too small saddle is painful for the horse. If it is placed too far forward, on the wither, a saddle will inhibit the horse from moving his shoulder freely.Tight girths also cause discomfort and pain. An uncomfortable saddle and/or a tight girth prevents the horse from opening its ribs and breathing deeply, and thus from taking in enough oxygen to enable him to use his muscles correctly. – A stiff or crooked rider can also make a horse sore, stiff or crooked. – Furthermore, inappropriate bits (or insensitive hands on the reins) cause pain in the mouth. There is a common misconception that a young horse must learn to “accept” the bit. There is no need, and we should not be in a hurry to make the young horse accept the bit. Bring the horse slowly up with very simple exercises, till he learns to carry himself, and the weight from the rider. There is a lot for the young horse to learn to accept besides the bit. Forcing a young horse to accept the bit very early in his training can cause him to lean on the bit and go on the forehand. A young horse at the very beginning of his training will tend to fall on the forehand for a time until he gains strength in his body in order to carry himself. Forcing a horse into a frame, an unhealthy posture, is not going to allow the horse to develop his independent balance or self carriage. This may not be noticed by the novice rider in the earlier stages but come the time to begin lateral work and the rider will notice many evasive tactics and a heaviness instead of light fluid movements. A horse can go over the bit (using the wrong muscles in his neck) or behind the bit (behind the vertical) to avoid the pain caused by a strong hand. This will make a horse’s spine stiff. He will rush through corners, drop the shoulder to the inside, and his circles will get smaller as he falls into the circle. This creates an ugly picture both to look at – now and in the future, because the horse will not have a long future, working this way. It puts too much pressure on the joints, tendons, ligaments, muscles, bones and mind. Strong rein contact also causes problems for the young horse. When the contact is hard and unfeeling, the horse cannot respond. We can see this too often at the higher levels, when riders need to have their hands up to their chest to “lift” the horse for piaffe and passage. If they lowered their hands, the horses’ heads and necks would just drop because they would feel insecure. This reflects a flaw in the foundations of the training. We shouldn’t have to lift a horse up with the reins. The contact between hands and the horse’s mouth should be minimal – and this is what we should aim for from the very first when training a young horse: a steady butlight and giving connection. Remember we are strengthening the body and training the mind during these early stages. Never bring the horse behind the vertical or cause it to be frightened of stretching out in case its mouth is hurt. Riding a young horse behind the vertical is a big mistake. Through all work, including transitions, the horse must stay in front of the vertical. There can be no independent balance or true forward without it. Working a more experienced horse behind the vertical also happens when the rider mistakenly thinks that this enables the horse to use his back. You can force the neck into an outline, but this does not give you collection. Collection can only come from a horse allowed and able to move freely – having learned to carry himself through training which lets him develop his own balance and rhythm. The body of the horse at these stages of training should reflect great elasticity and be able to collect and extend in and out of movements with fluid ease. Impulsion requires a number of things, a combination of many things – regularity of stride, the rider’s ability to combine subtle use of leg pressure with hands used softly, in harmony, and with give and take. This is finding the balance between the horse’s movement and yours. Provided you are in harmony with your horse’s movement, you are moving closer towards creating cadence and lightness, and therefore on your way to creating true collection. 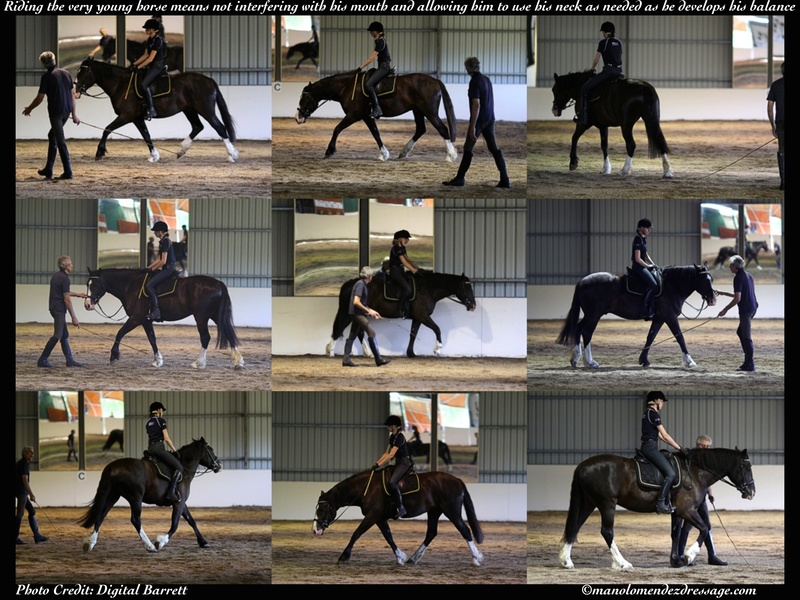 This is why developing balance and rhythm in the young horse during those initial phases becomes so important to his being able to move forward in self-carriage. Working with a young horse, every stride we take together is meant to allow him to reach his fullest potential comfortably and expressively down the road. If we take our time now, we will be rewarded later. Having to re-muscle, re-align and re-instill independent balance–when a horse has been ridden into resistance, soreness and asymmetry and now relies on the rider for his balance — is a much harder task then simply starting a young horse slowly without placing expectations ahead of conformation, temperament and ability. We have to remember that every time we work incorrectly, we are building muscles that will resist us, and damaging joints that will fail us, when we begin to ask for more lateral work, more collection, more engagement. Every step we take is either a step towards a stronger, straighter, suppler, more confident, more balanced and forward horse or a step toward crookedness, impure gaits and possibly career ending lameness. It is up to the rider to make every single steps count.